Crossover - the same record appearing on multiple music charts. Example: "Blue Suede Shoes" by Carl Perkins was listed on the Country, Pop and R&B charts. The first records to crossover were by black vocals groups and signaled the beginning of the rock era. The first groups consisted of members who generally were 20 -30 years old. The records were rooted in jazz and R&B and adult oriented. The Dominoes and the Midnighters would be examples of this group. 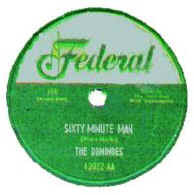 "Sixty Minute Man" recorded in 1951 by the Dominoes (#1 R&B, 17 pop) was the first significant R&B record to crossover to the Pop chart. The significance being that it was recorded by a small independent (Federal), its ranking on the pop chart and large sales to teenagers, many who were white. The song represented all the reasons ( heavy beat, suggestive lyrics and singing) that parents didn't want their children listening to rhythm and blues. "I was being lambasted for dirty lyrics for dirty lyrics on "Sixty Minute Man".....The problem was that white kids were listening to those things for the first time.It was alright so long as blacks were listening, but as soon as whites started listening,it was no good. Then it became a big political thing." "Sixty Minute Man" would be considered a fluke and soon forgotten. "Crying in the Chapel" recorded in 1953 by the Orioles was another important record. The Orioles in contrast to The Ink Spots and The Mills Brothers sounded unmistakably black. An old country ballad, "Crying in the Chapel" (#11) almost made it to the fable top ten and showed that there was a white audience for rhythm and blues records. 1954's "Work With Me Annie" by the Midnighters caused another uproar. The lyric "Can I get some work tonight, baby? had an unambiguous meaning and "Annie, please don't cheat/Give me all my meat" was thrown in for who weren't sure what the lyrics song was about. "Work With Me Annie" was recorded on Syd Nathan's Federal label and Nathan took full advantaged of a joke by a west coast deejay. It seems that the deejay had told his listeners if they liked "Work With Me Annie" they'd love the squeal "Annie Had A Baby." When orders began coming in for the nonexistent record Nathan wrote, recorded and released a record by that name in 1954. The teenagers loved it. For those who weren't sure of what the lyrics meant the Midnighter's follow up record was "Annie Had A Baby (Can't Work No More). "Work With Me Annie" led to a number of songs such as "Annie's Aunt Fannie," Henry's Got Flat Feet (Can't Dance No More)," and Etta James' "answer" song "Roll With Me Henry" renamed "The Wallflower". Georgia Gibbs would cover "The Wallflower," renamed "Dance With Me Henry, clean up the lyrics and make it a #1 pop hit. In 1954, rhythm and blues began a transition to the younger sound that would be called doo wop to distinguish it from the earlier sound. As black vocal groups became more successful in crossing over as the songs became more melodic with younger lyrics and universal themes that appealed to the younger audience and was perceived as less threatening by their parents. The crossover floodgates opened wide in 1954. The Major record companies had always considered rock and roll a fad. The success of the crossovers was forcing them to finally face reality. The industry's response would be one of "Covering."